Julia Hilton, right, and Andrea Needham, the Green Party’s councillor candidates for Old Hastings ward, prepare to hand in the petition at Muriel Matters House. A petition with 1,000 signatures has been handed by Hastings Green Party to the Foreshore Trust, owner of the land on which the Flamingo amusement park and boating lake are located, calling for rights of way on the Stade to be protected. 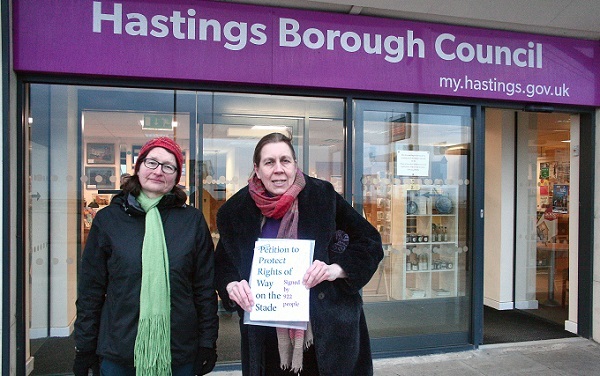 It comes hard on the heels of a petition with 122 signatures delivered by Old Hastings Preservation Society (OHPS) to Hastings Borough Council planning committee in the name of chairman, Richard Street. The petition opposes the planning application made by the amusement park owner, Flamingo Park Ltd, which amounts to “enclosure by stealth”, Anne Scott, chair of OHPS, told HOT. The application has also raised concerns among members of the Hastings and St Leonards’ Coastal Users’ Group, which consists of representatives of relevant bodies and councillors. At a meeting in early March disappointment was expressed that the group had not been notified by the council of the application, which was made last December, and “strong opposition” to it was voiced: “The site is a key site and right of way is an important issue,” the minutes record. The planning application (HS/FA/17/01056) proposes several changes and new features for the amusement park and boating lake, including a “new formalised and landscaped pedestrian footpath from adjacent to shelter [on the pavement], to beach front access”. The owner has also applied for a Lawful Development Certificate (HS/EX/18/00067) seeking to have the amusement park and boating lake, which are divided by the public footpath, classified as a single area for planning purposes. The planning statement submitted in support of this application claims that the amusement park and boating lake form a single site extending from the Hastings and St Leonards Angling Association in the west to Stade Hall in the east. It refers to the public footpath as a “private access way” and states that, “There seems [sic] to be no public footpaths running through the site”. However HBC’s legal services department has a different view, as the Greens point out. The amusement park and the boating lake have different primary uses as defined by the regulations, and are located in distinct areas, its comment says. According to government guidance, a certificate containing wrong information (such as that two sites with different uses share a common use) should not be issued as this can cause serious future planning problems. The advice of the legal services department concludes that a certificate should not be granted on the basis “that there are 2 physically separate areas that each have a separate primary use”. History seems to be repeating itself, Anne Scott says. Some 10 years ago, OHPS applied to have the footpath designated as a public right of way. The case was ultimately decided at ministerial level by Defra, the Department for Environment, Food and Rural Affairs, which concluded that designation was not necessary as, since the land is owned by the Foreshore Trust, the public is guaranteed use of the footpath. However, it is not known if the status of the footpath is defined in the lease issued by the Foreshore Trust to Flamingo Park. the application for the Lawful Development Certificate has been refused permission. “The Council are of the view that the Boating Lake and Amusement Park have clear, demonstrable and different primary uses (D2 in the case of the Boating Lake and Sui Generis in the case of the Amusement Park). In addition, the area around the Boating Lake is not fully enclosed, being open along the southern boundary and partially open along its eastern and western boundary. “The Council have requested amendments / additional plans for the FULL planning application proposing extensions and alterations to the amusement park. The agent has agreed an extension of time to enable them to submit these details. It is likely that further consultation will be undertaken when these amendments have been submitted. Given the number of objections this application will be heard by the planning committee should the planning department eventually get to a position where they consider the application should be recommended for approval. We are not at this stage yet and have raised a significant number of concerns with the proposals and potential impact on the character of the conservation.